We have month-long trial access to Wiley Digital Archives, currently comprising archives from the New York Academy of Sciences, The Royal Anthropological Institute and The Royal College of Physicians. 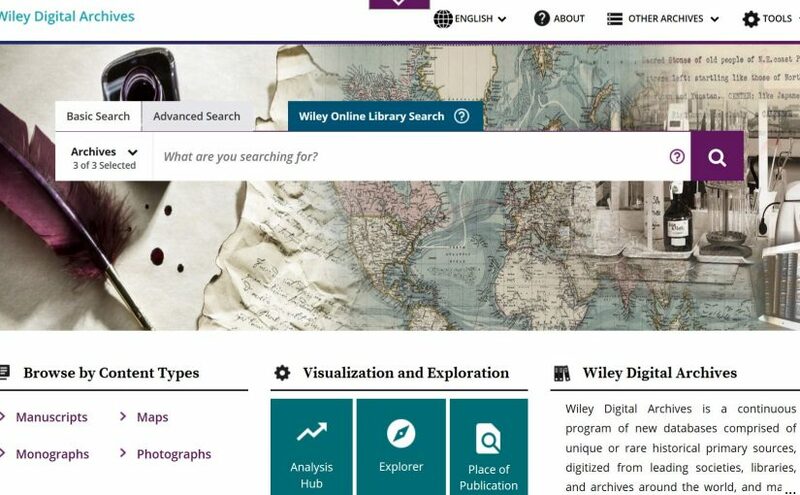 Wiley Digital Archives is a continuous program of new databases comprised of unique or rare historical primary sources, digitized from leading societies, libraries, and archives around the world, and made accessible in ways that tie directly to research outcomes and educational goals. All Archives are cross-searchable, and contain tools for searching, browsing, analyzing and visualizing primary source content. This database offers the digitized archives of the New York Academy of Sciences from ~1803 to 2013, and contains a range of searchable manuscripts, correspondence, reports, conference papers, proceedings, maps, surveys, data and ephemera produced by the researchers and members of NYAS. The history of science and medicine in North America are represented in this collection, which also focuses on environmental history, pollution, human rights, public health and ethics. This database offers the digitized archives of the Royal Anthropological Institute of Great Britain and Ireland from ~1763 to 2016, and contains a range of searchable manuscripts, correspondence, reports, conference papers, proceedings, maps, surveys, fieldnotes, drawings, data and ephemera produced by the researchers and members of the RAI. Featured is a collection of over 200,000 ethnographic photographs, taken by anthropologists all around the world. The RAI collections covers the history of anthropology (cultural, biological, medical, visual), and connects to colonialism and other aspects of the social sciences and humanities, with content drawn from an array of expeditions and studies across the globe. This database offers the digitized archives of the Royal College of Physicians of London from ~1300 to 1980, and contains a range of searchable monographs, rare books, manuscripts, correspondence, reports, conference papers, medical reports, medical education textbooks, proceedings, lectures, anatomical drawings, public health surveys, photographs, drawings, data and ephemera produced by the researchers and members of the RCP. The history of medicine from early origins in folklore through to the modern practice is represented in this collection, with strong connections to the medical humanities, the interactions between medicine and culture, religion, and government, the establishment of public health systems, and the policies which govern medical education and practice. For all three databases, the content is presented as digital images, with searchable text and metadata, on a platform which also allows for visual and textual analyses and is cross-searchable with archives from other societies in the Wiley Digital Archives program. Please explore and send your comments to your Liaison Librarian by the end of April 2019.